Recent films about fictional war correspondents have been about women – Juliette Binoche in 1,000 Times Good Night, Isabelle Huppert in Louder Than Bombs – highlighting the fact hat this most dangerous of journalistic specialisms is not a male province. Indeed, some of the best war correspondents have been women. 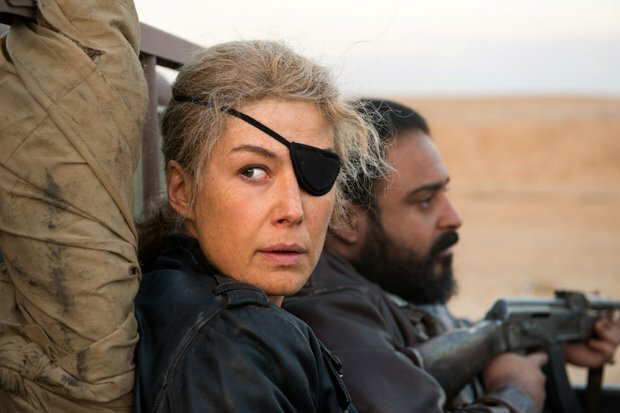 One such was the celebrated, courageous, difficult and tragic Marie Colvin – who constantly put her own life at risk to bring atrocious, heartbreaking stories to the world. Based on the Vanity Fair article 'Marie Colvin's Private War', Matthew Heineman's film is a lean, no-holds-barred portrait that reminds us of the human cost of war and the sacrifices made by those who inform the world of it. The film picks up her story in 2001 and structures it around particular assignments: the Sri Lankan civil war in 2001, where the reporter loses an eye in a blast; Iraq in 2003, where she uncovers a mass grave of the civilian victims of Saddam Hussein's soldiers; Afghanistan in 2009; and finally Homs in Syria in 2013. Visceral scenes from these war zones are cut with her returns to London, as she suffers from alcoholism and post-traumatic stress disorder. Heineman (making his narrative feature debut after a string of documentaries, including City of Ghosts and the Oscar-nominated Cartel Land) and his editor Nick Fenton adeptly weave a compelling story structure. The action sequences are frighteningly realistic. The men in Colvin's life and the actors playing them are foils: Jamie Dornan, the loyal and protective photographer; Tom Hollander, the foreign editor who needs, admires but also despairs at his diva-like ace; Stanley Tucci, the lover who represents the possibility of a normal life. But it's Pike's show, and she's mesmerising, discomforting and inspiring.